Can I Secure a Loan with Bitcoin? Part I - Ward and Smith, P.A. Each day seems to bring another story about Bitcoin, Ethereum, Litecoin, or another virtual currency. Article 9 allows a creditor to create a security interest in personal property. The owner of the property grants the creditor a security interest through a written security agreement. The security agreement creates the security interest between the secured party and the debtor. The secured party must then “perfect” the security interest to obtain lien priority over third parties and to protect its secured status should the debtor file bankruptcy. Security interests are perfected in different ways depending on the type of collateral. Article 9 divides personal property into different categories, such as goods, equipment, inventory, accounts, money, and intangibles. The primary ways to perfect a security interest are (1) filing, with the appropriate filing agency, a UCC-1 financing statement containing a sufficient description of the collateral, (2) possession, or (3) control. Virtual currencies are electronic representations of value that may not have an equivalent value in a real government-backed currency. They can be used as a payment system, or digital currency, without an intermediary like a bank or credit card company. 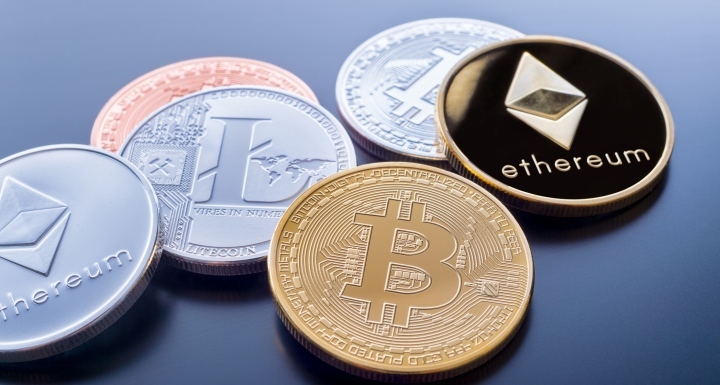 While virtual currencies can function like real currencies in certain transactions, and certain virtual currencies can be exchanged into real currencies, a virtual currency itself does not have legal tender status. Virtual currency is virtual—there is no bitcoin equivalent to a quarter or dollar bill. Bitcoin operates on a protocol that uses distributed-ledger technology. This technology is called the blockchain. The blockchain eliminates the need for intermediaries such as banks. Unlike a dollar, which is interchangeable, each bitcoin is unique. The blockchain records all bitcoin transactions to prevent someone from re-spending the same bitcoin over and over. Suppose you wanted to transfer cash to a friend. You could transfer funds from your bank account to her bank account. The banks act as intermediaries. Suppose you wanted to transfer cash to that same friend without a middle man. The only way to do that is meet her and hand over the cash. This exchange may not be practical for many reasons. You might live far from each other. Even if you’re near each other, you might not want to travel around town with a briefcase full of cash. Bitcoin and blockchain technology allow the transfer of cash directly and digitally without a middle man. The blockchain is both transparent and opaque. It is transparent as to the ownership chain of every bitcoin. In this way, it is easier to “trace” a bitcoin than to trace cash. But the blockchain presently does not show liens on bitcoin. So a secured party can confirm if a borrower owns bitcoin, but not if the borrower or a previous owner encumbered the bitcoin. At first glance, bitcoin would seem to fall in the category of “money.” Article 9 defines money as a medium of exchange authorized or adopted by a domestic or foreign government. No government has adopted bitcoin as a medium of exchange. Dollars, euros, and pounds meet the definition of money—bitcoin does not. Therefore, bitcoin does not meet the definition of money. And a secured party perfects its security interest in money by physical possession, but because bitcoin is virtual, physical possession is impossible. Is Bitcoin a Deposit Account? A deposit account is a demand, time, savings, passbook, or similar account maintained with a bank. With a traditional deposit account, the secured party perfects its security interest by having "control" over that account. This is usually accomplished when the debtor, the debtor’s bank, and the secured party execute a deposit account control agreement. If the debtor defaults, the secured party can direct the debtor’s bank to transfer the funds from the account. Bitcoin often is stored in a digital wallet with an exchange like Coinbase. The wallet is access-restricted by private keys or passwords, but that wallet is not a deposit account. The bitcoin itself is held by its owner on the blockchain, which is decentralized. Unlike a deposit account, there is no intermediary like a bank. With no intermediary, there is no way to establish “control” over the bitcoin. Consequently, bitcoin does not meet the definition of a deposit account. By process of elimination, bitcoin should be treated as a general intangible. A general intangible is personal property that does not fall into any other Article 9 category. A lender perfects a security interest in general intangibles by filing a UCC-1 financing statement. In North Carolina, you file it with the Secretary of State. Although we can categorize bitcoin as a general intangible for Article 9 purposes, and create and perfect a security interest accordingly, several issues arise that question the overall effectiveness of that security interest. For starters, a security interest in general intangibles follows the sale, license, or other disposition of the collateral, unless the secured party consents to the transfer free of its security interest, the obligations secured by the security interest have been satisfied, or the security interest has otherwise terminated. This is a problem for the lender wanting a first-priority lien on the bitcoin. Before approaching the lender, the borrower may have granted a secured party a security interest in bitcoin, or granted a security interest in “all assets whether now owned or acquired later” and then acquired bitcoin. In both instances, the bitcoin is encumbered by the security interest. The lender could not confirm prior liens without searching UCC-1 filings in all 50 states (and even that might not catch international liens). Even if a secured party acquires a senior lien in bitcoin, that party still has the problem of lack of control over the bitcoin. Without control, bitcoin collateral is susceptible to unauthorized transfers. Even if a borrower has an account at an online currency exchange like Coinbase—which allows you to exchange bitcoin into traditional money—the exchange may be unwilling to sign a tri-party control agreement to restrict the debtor’s ability to exchange the bitcoin. Upon default, without the debtor’s cooperation, it will be difficult or impossible to enforce, take possession, and liquidate the bitcoin. Putting aside its value and volatility, the intrinsically unique nature of bitcoin makes it an imperfect and problematic form of collateral under Article 9. Part II of this article will discuss the pros and cons of using Article 8 of the UCC to create and perfect a security interest in bitcoin. Article 8 has the potential to be a safer and more reliable solution for these transactions. If you have questions about bitcoin and blockchain in the secured lending context, please contact the attorneys of Ward and Smith's Financial Technology ("Fintech") team.